Inside the castle walls a battle rages in the heart of a widowed king. His son, the young Prince Hubert, has proven himself to be an unworthy heir to the throne. But a bold intervention by the king’s most trusted knight could prove to be the cure. In the remote lands of this vast kingdom, far from the walls of the palace, Hugh will learn that the requirement of kingship is servanthood. It is with great enthusiasm that we announce Lamplighter Theatre’s first dramatic audio! 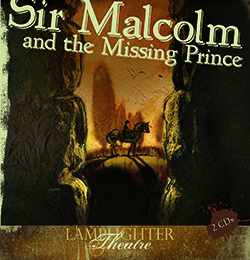 Sir Malcolm and the Missing Prince has been transformed into an exhilarating and suspenseful audio masterpiece. With a distinguished cast of world-class actors, memorable characters such as young Prince Hubert, faithful Dame Martha, and the solemn yet wise Sir Malcolm await you! From Christina of Rio Rancho, New Mexico on 2/2/2019 . We enjoyed this CD very much! Full of action and great story line. The story is told in such a way that it keeps the attention of young and old! The lessons it teaches always points us to our glorious Lord! From Janice Robinson of Neosho, Missouri on 10/15/2018 . My grandchildren and I love to listen to this CD on our way to school and church. This was the audio that started our Lamplighter obsession and nearly procured a speeding ticket for me. ;) LOL! This CD is better than the best movie Hollywood could envision! It is well acted, well written, gripping, entertaining, funny, full of action, and made my children want to go for long drives! When the thieves jumped out of the woods, I was so engrossed that I began to speed! (I suppose that I was outrunning them!) Fortunately, I realized what I was doing and reduced my speed before having to explain myself to local law enforcement! Seriously, this audio seemed to touch my children's hearts. They have always been pretty conscious of the needs of others but my 9 year old seems to be even so now. I have seen him consider my feeling more often and I have seen him put his younger brothers feeling before his own a few times as well. Also, after listening, he began to speak of diligence and his desire to be more diligent. He even asked me for a list of Bible verses about diligence! From Eileen Ray of Yorba Linda, California on 7/3/2018 . I purchased this CD to send to my young grandchildren who live in Greece. They love to hear stories and don't own a TV so I thought this would be the perfect gift. Of course I had to listen to it before I sent it on to them! Thank you for such a great production. I'll be buying more in the future! From Robert Rhinier of Elizabethtown, Pennsylvania on 1/20/2018 . Everything arrived in a timely manner. We ordered it for a Christmas gift for our grandson who lives out of town, so we have not heard the recording yet. Hopefully soon! 4 stars since we have not heard it yet.